Some items you just shouldn’t put in long-term storage if they need to be in a climate-controlled environment. They can be stored for a short term and here’s some tips for keeping them safe. Will it fit neatly in boxes or is some of it odd sizes like bicycles or floor lamps? Are you putting it there to just leave it for say, six to eight months while your house is being built or are you expecting to be taking things in and out? You’ve come to the realization that storing your ATV, motorcycle, bicycle or extra car in the garage over the winter is a bad idea because – well, you just don’t have room. You don’t want to be climbing all over the smaller vehicles or bike all the time and you need the space. A storage unit is a great idea. At Fox Den Store-It, we take pride in maintaining clean, safe facilities. Our staff works relentlessly to maintain the finest facilities possible. If you are in need of a storage facility – long term or short term, small or large, we are here to help with your storage needs. Keep your stuff but put it in a better place and we’ve got some good reasons for you to consider that makes storage a better idea than stashing. If you are not going to be able to ride your motorcycle for a couple of months, maybe because of the weather, or a military deployment or even a long vacation, there are steps you need to take to make sure your ride doesn't become damaged when it sits. 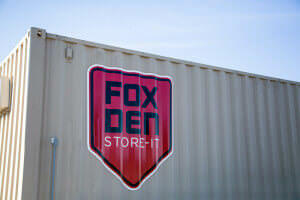 If you need a storage unit, at Fox Den Store-It we’ve got a number of sizes to chose from. Remember, you need to leave a path to get to the back of the storage unit and piling items up to the ceiling is not a good idea – you need some air circulation. While storage units offer an effective way to store a wide variety of items, there are some things that you should never keep in your storage unit. Suggestions on how to make the most of your self-storage unit and get the biggest bang for your buck.